As criminal operations become increasingly sophisticated, so too do the counter measures. In the past, securing a residential estate with a security officer at the gate and a paper-based book for visitors to sign in was sufficient, but now the need to integrate manned guarding and technology is not seen as a nice-to-have, but rather a necessity in protecting ourselves. G4S understands the ‘secure village’ concept of lifestyle estate protection and has the knowledge and expertise to offer a range of integrated secure solutions based on a comprehensive risk assessment. We also believe that security is the responsibility of everyone within an estate and that it is imperative to have the support of residents who need to actively participate in securing their environment and making security related decisions. You can install technology and provide all the manpower in the world, but if the back door is left open, so to speak, nothing will prevent criminals from taking advantage. Once everyone is on board, we believe that the safety of an estate relies on multiple layers of security. Perimeter: Starting from the outside and moving inwards, perimeter protection needs to be addressed first. Ideally, this decision needs to be made in conjunction with the developer and a balance reached between a secure perimeter and development economics. In most cases, electric fencing is chosen as a solution and is very effective. A critical area to plan for is the maintenance of the perimeter fencing and must not be overlooked. Access control: This is the next area to address and there are many new and innovative systems available. 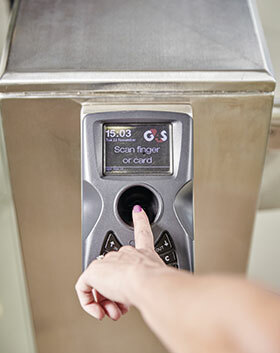 Biometric systems are an effective way to record access and egress details and to ensure that identity is not transferred – as can be the case with card or tag-based systems. Where your gatehouse is situated is also something to consider in an estate. Your security personnel are also at risk of attack and should be protected within the layers we are recommending. Within the estate itself, there are a number of other security measures that can be implemented, including video surveillance in high risk areas; fire detection systems and public-address systems in communal areas, and vehicle and manned guarding patrols. A detailed risk assessment will help to identify areas of risk specific to your estate and these can be addressed in consultation with developers and residents. Residents should also accept responsibility for the protection of their own assets and immediate surroundings by installing alarm systems and barriers. Many people are lulled into a false sense of security when purchasing property in a secure estate, and forget basic security measures like locking doors and gates, and not leaving valuables lying around. Work with your security provider to ensure that all areas of security are addressed. There is still one area of concern and that is what we term the ‘threat from within’. Increasingly crime syndicates do not access estates from the outside, but go as far as to purchase property and operate from within the estate. To resolve this type of threat we believe the solution is the integration of systems and the analysis of resultant data. This type of service needs to be conducted by security personnel trained to do so. You can proactively secure your environment by monitoring trends and unusual activity and issuing alerts before criminals have time to act. The monitoring of such systems can be done on- or off-site in a number of different ways, using technology and/or personnel. We must not neglect the importance of people and positive human interaction. By deploying well-trained security officers who understand the intricacies of estate security, you provide the human touch one would expect in a residential environment. Ensure that the staff deployed at your estate have undergone training specific to the residential estate environment and do not overlook the importance of skills such as providing life support or fire-fighting and soft skills such as public relations and conflict resolution. Many abstain from firmware upgrades as, once they have purchased a system and it fulfils the purpose, they reason that there is no need to undertake a costly upgrade and risk system compatibility. SECaaS promises to comprehensively arm companies of all sizes with the tools they need to protect themselves from harmful cyberattacks.